Source Code Pro is a new font released by Adobe. It does wonders for technical fixed width and source code text readability. I highly recommend to use this font with your text editor, terminal and other software development tools (Especially if your eyes are getting old like mine). UPDATE 2: I am not sure how subpixel antialiasing affects the screenshot quality. The images definitely have some LCD subpixel antialiasing if you zoom in. All screenshots were taken on Macbook Pro, OSX Mountain Lion, 1920 x 1080 external monitor (no retina). The font itself is also open source: download at Github for your Windows, OSX or Linux. The only downside I have found is that the bold Source Code Pro variant looks muddy with OSX font antialiasing. 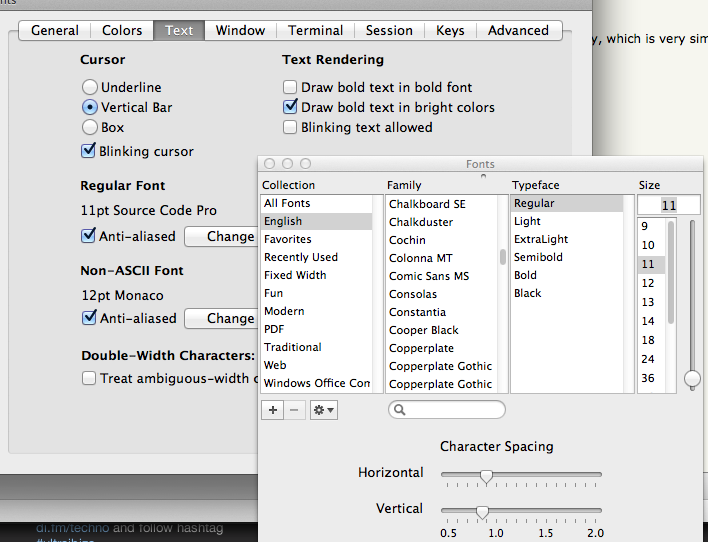 Thus, I had to disable iTerm 2 option “show bold text with bold font”. This is actually a legacy ANSI text formatting option and means the font brightness (grey vs. white, brown vs. yellow, red vs. pink) so no much harm done. This entry was posted in linux, plone, python, shell, Sublime Text 2 and tagged adobe, github, iterm, source code pro, sublime text 2, zsh by Mikko Ohtamaa. Bookmark the permalink. 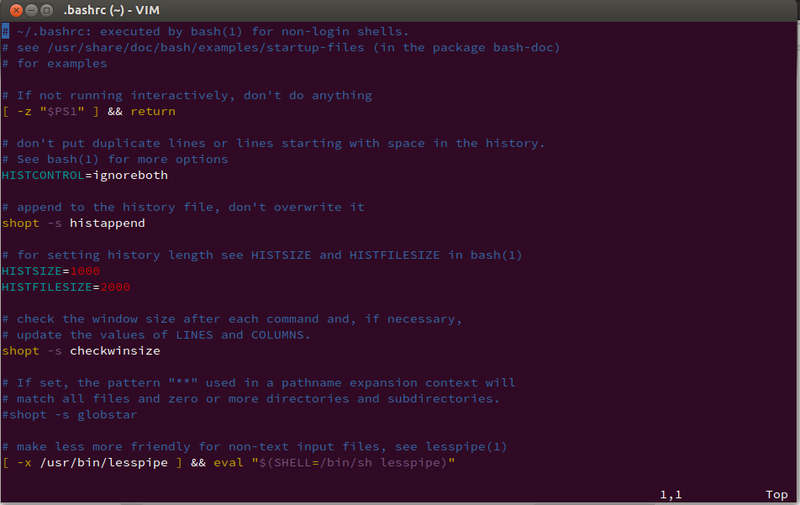 I tried many monospaced fonts for years and when Ubuntu Mono was created I haven’t looked back. It looks superb antialiased and the O vs 0 problem is also resolved. I use it under Ubuntu Linux so maybe it’s tweaked to it’s font settings (also there are some custom Ubuntu patches to font rendering engine). I just tried Source Code Pro and it’s good but not perfect to my taste: too much spacing between lines, too thin. Smaller sizes look much clearer as Ubuntu Mono. Yet I see in your screenshots it’s not so thin so rendering engine and settings play huge role. Please note that Source Code Pro comes with varying lightness degrees (I think there was 5 of them). 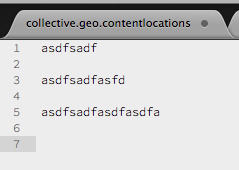 Also the spacing between lines setting can be adjusted at least in iTerm 2 and I have modified it to my preference. 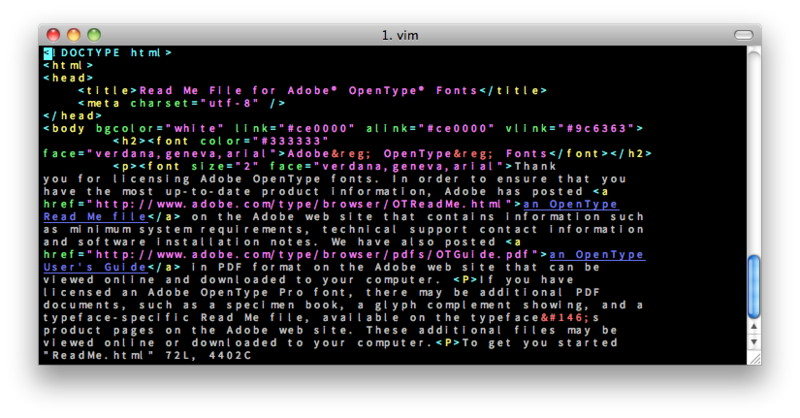 I still prefer crisp Terminus for terminals and editors. The only downside is lack of bold version in low sizes. What Artur was trying to say was that Source Code Pro doesn’t look good with Ubuntu’s font rendering. 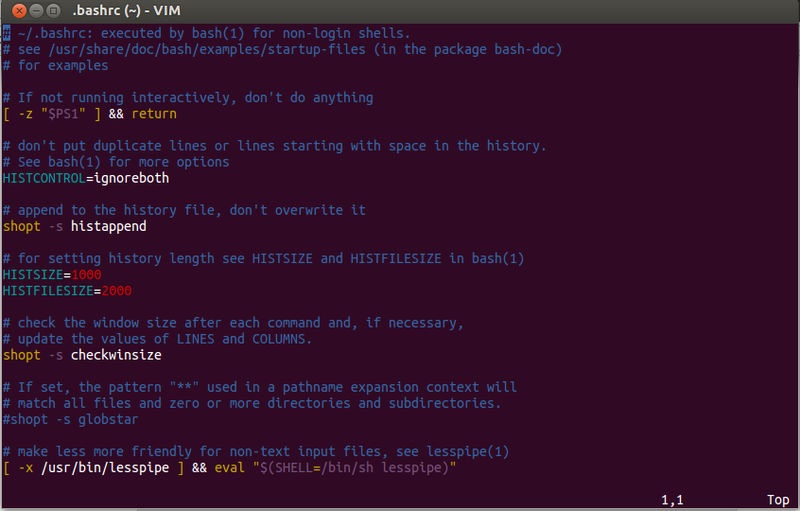 I don’t like it, personally I use Menlo Regular (9) in both Sublime Text and Terminal, it works great. This looks great! I like this trend of designers and software engineers working closer together, I think attributes of the two fields are rubbing off on one another. I wouldn’t have cared less about this a few years ago but after working closely with a typographer/designer I find myself pointing out fonts on signs and I definitely appreciate something like this. I also notice a proud sense of hacker accomplishment when my designer buddy pulls off a css/js modification! Even eclipse’s ui is starting to look nice, bring on the geek design! If you like it, you’ll probably like Inconsolata, too. I added some notes about subpixel antialiasing and vertical and horizontal space adjustment, as Hacker News folks where discussing about them. I second the previous comment about Ubuntu Mono. I yet have to find a font that has a better combination of pleasant looks, excellent legibility and high compactness. Source Code Pro runs a lot larger at the same size, wasting too much space for my taste. I’m using it in iTerm 2 on the Mac, and I love it. I prefer http://font.gohu.org/ over every other monospace font I’ve ever used. Source Code Pro isn’t as nice as a bunch of other fonts, IMO. Out of curiosity, what color scheme are you using for your “black on white” screenshot? It seems less harsh than most of the black on white themes I’ve seen, because of the grey background. Source Sans Pro doesn’t have Cyrillic character, does it? 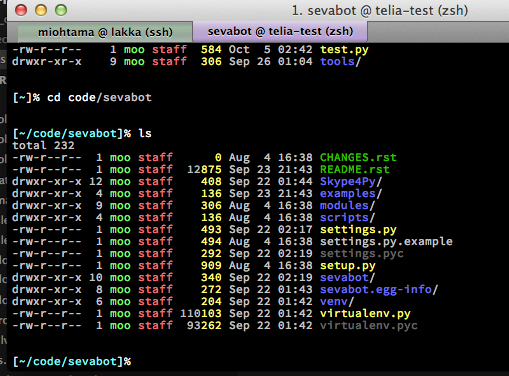 From these screenshots, and my own terminal, I still prefer Consolas or Inconsolata. I personally prefer Monaco http://en.wikipedia.org/wiki/Monaco_(typeface) because, while also solving the problems you listed, also looks a bit more harmonious and mixed with OS X’s antialiasing it’s pretty fabulous to work with in Sublime Text. I think I tested it with Monokai Bright theme in Sublime Text 2. Most important factor for me is how it looks at 7px? And that’s with the character spacing reduced below the default. ‘m’s run into their neighbours long before other spacing looks right. I realise this isn’t the expected behaviour and that some sort of disaster has befallen my setup, so can anybody suggest what might be wrong? Having read your post I gave Adobe Source Code Pro a try and as other comments have already noted Ubuntu Mono is much better. Source Code Pro looks nice but as others have pointed out it uses IMHO too much space. Definitely unusable with the default spacing, but managed to make it look pretty nice on iTerm2 (http://cl.ly/image/2N2i0M2K2V2u/Cloud.png).